A group calling itself 99 New York is going to stage a march today in support of Occupy Wall Street. It includes UnitedNY, Strong Economy for All Coaltition, NY Communities for Change, the Working Families Party and a bunch of other community organizations. They plan to march to the homes of several Masters of the Universe and present oversized symbolic checks representing the additional monies that will begin to line the pockets of the 1% once the New York State “millionaire’s tax” expires the end of this year. The marchers are meeting up at the corner of 59th Street and 5th Avenue at noonish. The march sets off at 12:30 after a brief rally at 59th. For non New Yorkers, this is the iconic corner in front of the Plaza Hotel at the Southeast corner of Central Park. 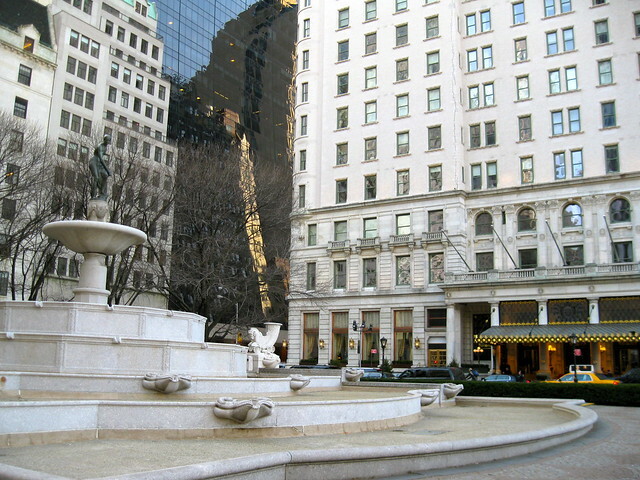 There is a plaza out front, officially known as Grand Army Plaza with the Pulitzer Fountain at its heart, which gives the hotel its name. There is a subway station serviced by the N, Q & R lines. There are also nearby subway stops at Columbus Circle and at the Citicorp Center that are crossroads for lots of subway lines. From the plaza, the march will head up Fifth Avenue to Rupert Murdoch’s home between 63rd & 64th on Fifth Ave, then move on to David Koch’s residence at 71st & Fifth. Eventually they will end up at JP Morgan Chase CEO Jamie Dimon’s home at 93rd & Park. The weather is perfect for a brisk autumn walk. There will be speakers at each stop to explain the specifics of the huge tax windfall that each billionaire is slated to receive when New York’s millionaires tax expires on December 31st. Afterwards, the marcher will head down to Liberty Plaza—I have to assume by mass transit because I have done the walk from downtown to midtown and it’s a bit of a hike. Giving millionaires and billionaires a tax break when we are cutting schools, cutting services to seniors and kids, and failing to deal with our crumbling infrastructure and mass transit needs is simply wrong. While 99% of New York is being asked to tighten their belts and share in the sacrifice, the richest 1% are lining up to put more money in their pockets. We Are Not Supposed To Be A Democracy!